Premier Fencing and Backyard Solutions has been serving its customers in Southern Ontario for over 90 years. We’ve been the industry leader in offering affordable and high quality fencing, and have been the ‘go-to’ in respected deck and pergola installation. Premier Fencing has excelled in both the residential and commercial markets since our early beginnings. Our skilled pergola installation team will assist with all planning, design and installation, and is always happy to work with you to create and install your custom pergola, arbor or trellis, fence or deck. Yardistry manufactures a unique and innovative line of rooms, privacy seating and entry structures, providing creative solutions to conventional landscape elements. 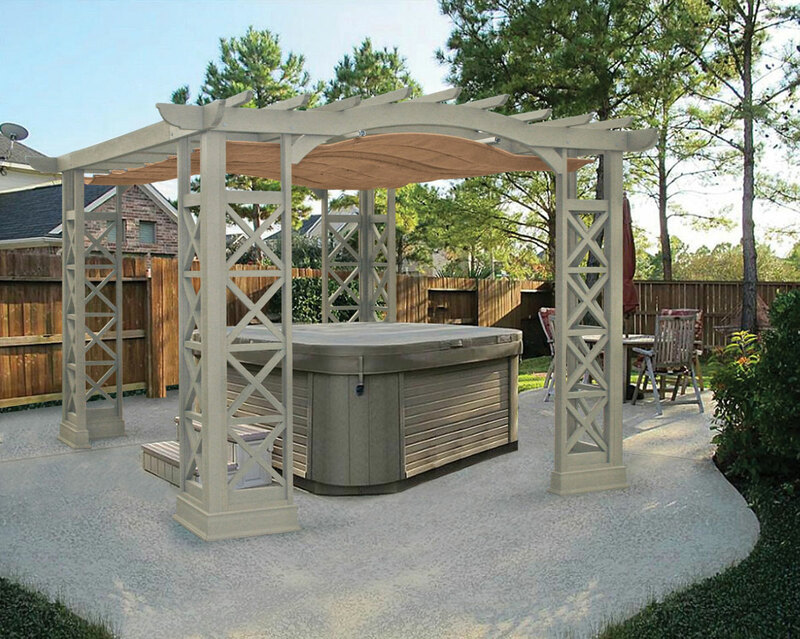 Yardistry pergola’s & structures are affordable and easy to assemble and can be used by professional installers and DIYers alike. One of the biggest considerations when purchasing an outdoor product is the choice of material. Every Yardistry pergola is built with 100% premium cedar (Cunninghamia Lanceolate) lumber giving your Yardistry product a distinctive, premium look and feel. Yardsitry pergolas are now available in both soft and hard roof options, providing shelter from the elements and harmful UV rays while providing a cozy outdoor living space. 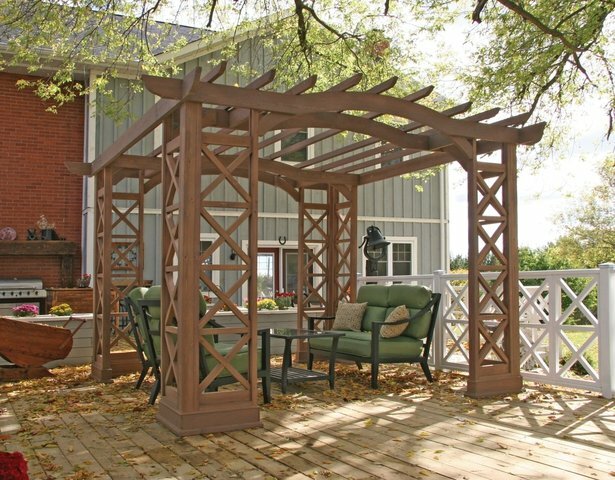 Choose from one of many attractive Yardistry pergola designs to enhance your backyard, business or vacation property. Premier Fencing, since 2012, has built a strong relationship with Yardistry and is proud to be an Authorized Installation Partner. Our team of knowledgeable installers have been trained in both the construction, and literature on all of Yardistry’s product line. See some of the most frequent Q&A below. Don’t see the answer to your question? Call in to speak with one of our Yardistry pergola builders. Q: Can I re-locate my Pergola? A: Yes, your Yardistry Pergola can be re-located if required. Give us a call and we will be more than happy to quote you a price for the relocation. Q: What type of wood are the pergolas made of? A: All Yardistry wooden components are made from premium exterior grade cedar. Q: Will I need to re-stain my Pergola? A: We recommend that you re-stain your pergola yearly to maintain the color, minimize warping and prevent rotting. Q: I want to re-stain my Pergola, what kind of stain should I use? A: If re-staining your Yardistry Pergola use a solid colour water based stain and follow the stain manufacturer’s instructions for application. Q: Can I paint my Pergola? A: Yes, if you want to paint your pergola user an exterior acrylic based paint, and follow the manufacturer’s instructions for application. Q: How do I clean my Sunshade?A: To clean your sunshade use a sponge or soft brush to apply mild soap and warm water to the fabric. Rinse thoroughly and let air dry. For more stubborn stains or mildew, add one cup of bleach per gallon of soap and water. Apply directly to the stain with a sponge or soft brush, rinse thoroughly and air dry. If necessary repeat with additional bleach. Q: Do I need to secure my Pergola to the ground? A: Although it is not necessary to secure your pergola down we do recommend it. Fastening methods will vary dependent on the base to which the structure is being secured. The installation contractor provides no warranty or assurances that these surfaces can properly support the Pergola. Q: What happens if my ground is not perfectly level? A: This depends on the product you are having installed. Our Solid Roof and Retractable Sunshade can only be installed on solid surfaces that have less than 1/2″ of slope over 10′. Installing a Pergola Room on an uneven surface can make the room look crooked and out of square. Should your surface require a greater amount of work we would be happy to quote you on the required work. Q: What is the Sunshade made of? Yardistry components are made of a long lasting exterior grade cedar finished with a water based stain for an attractive appearance. All Yardistry components come ready to assemble and pre-stained. Yardistry strives to be an innovate leader in both the design and safety of their custom pergola systems, and their product line speaks for itself. 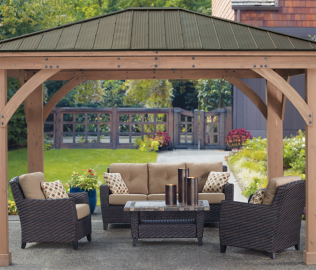 Whether you choose the Yardistry pergola sun shade, Yardistry aluminum hard top, retractable sunshade or any number of other attractive Yardistry products, you’ll be ready for years of enjoyment. So, when it’s time to look for reliable and affordable fence and custom pergola builders, you need look no further than Premier Fencing and Backyard Solutions. We’ve been serving Southern Ontario for over 90 years. Enhance your property with a Yardistry pergola installation today. 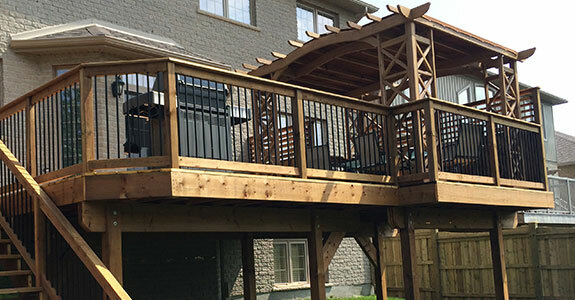 Premier Fencing and Backyard Solutions are proud of their reputation as one of the leading fence, deck, and pergola builders across Southern Ontario. We plan on delivering high customer satisfaction, top notch product quality, superior installation, and product variety for many years to come. Together we can plan and create interesting and affordable outdoor spaces that fit your lifestyle and enhance your property value. Clear access to the site, and a minimum 2′ clearance on all sides of the proposed structure location. If required site conditions cannot be met, Premier will be happy to prepare a quote for the required site work. 4 – Prepare your installation location. Necessary site preparation is solely the customer’s responsibility. Ensure there is a clear path to the installation site and that all toys, furniture, pets etc. have been moved. One of the Premier customer service representatives will contact you to confirm your installation date. Delivery time will fluctuate based on seasonal volume, weather conditions and other uncontrollable events. Please note that our crews install multiple products per day; therefore, the status of one order may affect many others. We ask our customers to be understanding if an unforseen event affects their installation. 6 – Enjoy your Pergola for years to come and know we’re always here to help.